Elastomeric rail products include rail boots, tie pads, and other rubber extruded products used by the railroad industry. These products are made from a variety of thermoplastic and elastomeric materials that are flexible, lightweight and have excellent shear and tensile strength. In railway applications, these materials help insulate components from electrical currents and reduce track system wear and tear caused by heavy loads and exposure to harsh environmental conditions. Northwest Rubber Extruders offers a full line of high quality, high performance railroad equipment and supplies. We offer rail boots and rail pads that are extruded from durable elastomeric and thermoplastic materials and easy to install. Thermoplastics are high strength, lightweight and provide excellent wear resistance, impact resistant and chemical resistance. They perform well in rail applications because of their excellent flex fatigue, durability and resistance to creep and tearing. Elastomeric materials are rubber compounds that resist tearing and breaking and have excellent heat and chemical resistance. The flexibility, durability and insulative properties of elastomers makes them perfect for vibration dampening, electrical insulation and noise reduction. 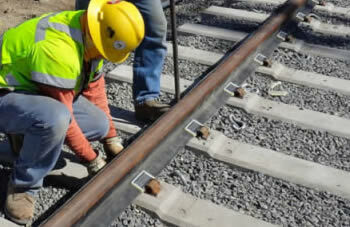 Our product line also includes elastomeric grout specially formulated for demanding railroad construction conditions. Request a quote on the thermoplastic and elastomeric rail products you need, or contact us for more information. Lowers the amount of noise generated by rail traffic. Dampens vibration that can lead to excessive maintenance costs. Reduces damage caused by road traffic and fasteners used to secure the boot to the rail. Designed with retaining clips to ensure a solid bond between the rail boot and surrounding materials. Designed for easy installation to reduce time and cost. Increases life on concrete panels reducing replacement costs. Distributes the forces caused by projecting irregularities on the tops of the ties. Protects the panel from repeated impact on the ties. Reduces impacts that can dislodge cargo, damage railroad ties, railcar structures, such as wheels, and degrade railroad track. 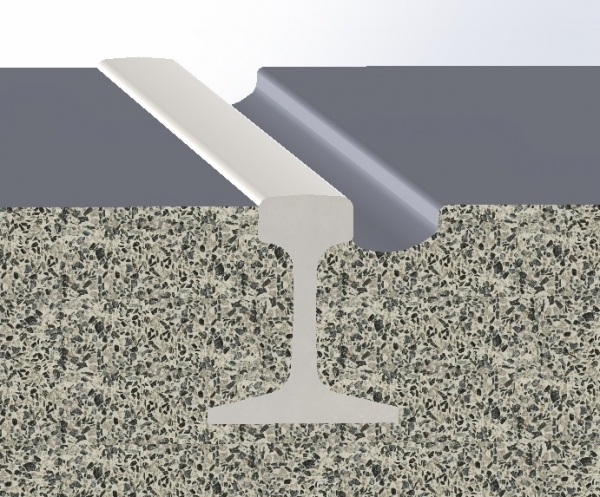 Lower installation costs –pads are molded into concrete tie. Reduces ballast breakdown and maintenance costs. Elastomeric grout has electrical resistant properties and helps dampen vibration and reduce noise generated by railway systems. LRT is a two-component elastomeric rail grout formulated with fast setting, return to service, Polyurethane. The product is specifically designed for use in rail applications to fill the space between transportation rail structures and the adjacent concrete. The LRT provides electrical rail isolation while absorbing sonic and vibration attacks without cracking. 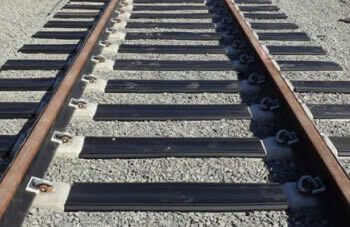 Norwest Rubber Extruders offers rail boots, rail pads, or elastomeric grout for your rail construction application. Request a quote on elastomeric rail products today or contact us to learn more.